Posted on 2018/05/15 by H.A.S. 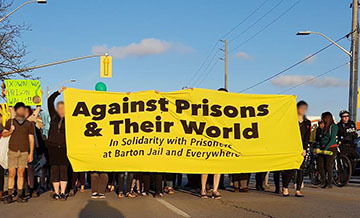 On Thursday, May 10th a group of folks carrying balloons, banners, and signs conducted a festive march around the jail to remind those on the inside that they have not been forgotten. Banging was heard from inside the jail letting folks on the outside know that they could be seen. In love and rage, support was shown for prisoners at Barton Jail.